Its been said that the chairman of the Federal Reserve Board is the second most powerful person in the federal government, after the president. It’s been said many times that the chairman of the Federal Reserve Board is the second most powerful person in the federal government, after the president. That’s because the Fed chair has enormous power and influence over the American economy. Fed chairmen have led the fight to slash runaway inflation (Paul Volcker in the early ‘80s); to reverse a stock market crash that was spreading globally (Greenspan in the late ‘80s and early ‘90s); and to prevent another Great Depression. 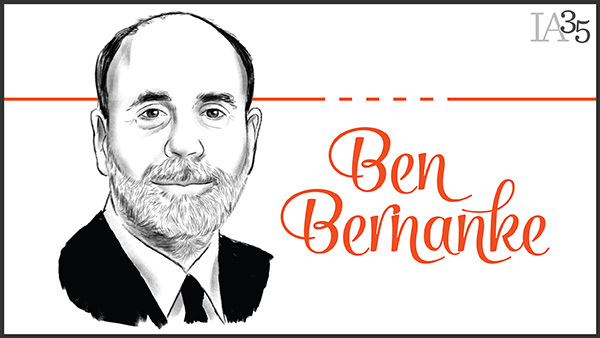 That’s what Ben Bernanke, a former Princeton economics professor who studied the Great Depression of the 1930s, accomplished during his tenure as Fed chairman from February 2006 until the end of January 2014. Bernanke assumed the chairmanship when the economy was humming along, growing at a 4.8% annual rate while unemployment was also 4.8%. But a year later, home prices that had more than doubled in the previous eight years were falling sharply, and the first of several subprime mortgage lenders was failing. By June 2007, two Bear Stearns hedge funds that held more than $20 billion in subprime mortgage-backed securities were collapsing. Bernanke, who had mistakenly said that the housing downturn would be “contained,” as many economists and Wall Streeters thought, got to work, leading the Fed in an unprecedented journey to save the banking system, the U.S. economy and, some would say, the global financial system as well. The effort began in earnest in late summer 2007 with the first Fed rate cut in more than four years. By March 2008, Bear Stearns had collapsed and was sold to JPMorgan Chase for $2 a share, with help from $30 billion in Fed financing. Then in September 2008, Merrill sold itself to Bank of America, Lehman Brothers collapsed (with no federal help) and AIG teetered on the brink before it was rescued by the Fed, the lender of last resort. Still the economy suffered. Growth in the third quarter of 2008 was nonexistent and the economy contracted for the first time in seven years. The Fed, which had been lowering rates since August 2008, then slashed rates another 0.75% to an unprecedented low between 0% and 0.25% in December 2008, and rates have remained there ever since. It was a bold move but not bold enough. Bernanke then initiated a program that only the Bank of Japan had tried before, but he outdid the BoJ. The Fed’s quantitative easing program, as it’s known, began with purchases of mortgage-backed securities from banks. Eventually it was expanded to include purchases of long-term Treasuries. The idea was to increase bank reserves so that banks could lend more money and to lower long-term yields – all to boost growth. But the economy continued to weaken, contracting by more than 6% in the first quarter of 2009. The Dow Jones Industrial Average plummeted to a low of 6,547 on March 9, 2009 and the unemployment rate soared to 10% that October. The Fed kept at it. After three rounds of QE over a period of almost six years, the Fed’s balance sheet swelled from roughly $900 billion to $4.5 trillion, and eventually the economy recovered and unemployment fell. By the time Bernanke left the Fed at the end of January 2014, U.S. GDP was growing at over 2% annually, the unemployment rate had fallen below 7% and the Dow closed just under 15,700. The Fed, under Bernanke, also became more transparent, instituting quarterly news conferences as well as quarterly economic projections (previously they were twice a year), disclosing when possible the degree of uncertainty policymakers attach to their economic projections. Throughout the financial crisis and afterward, Bernanke was criticized by members of Congress and others for sowing the seeds of future inflation and another asset bubble with the policies he pushed. But so far that hasn’t happened. Bernanke is no Alan Greenspan, the former Fed chairman who maintained low rates even as the economy was recovering and asset bubbles were forming. But the Fed has changed since it was created more than 101 years ago, and Bernanke is partly responsible. Although he’s no longer a policymaker at the Fed, Bernanke still seems interested in influencing it. He’s started a blog at the Brookings Institution where he’s now a Distinguished Fellow in Residence with its Economic Studies Program, which is almost all about monetary policy. In mid-April, Bernanke made a move that past Fed chairmen, Treasury secretaries and many of his former colleagues have made: He went to Wall Street. Bernanke is acting as a senior advisor to the Citidel Investment Group, a $25 billion hedge fund founded by billionaire Ken Griffin, and PIMCO. See the full 2015 IA 35 for 35, and the calendar for extended profiles of each honoree.